The Breeders' Cup Classic is very well named - the race is very often a classic. We have been spoiled the last few years - Arrogate's duel with California Chrome, American Pharoah's brilliant swan song, Bayern crashing the Shared Belief party. Early this year it was tough to get excited about this race because the older horse field seemed to be made up of one horse, and the three-year-olds were underwhelming. But the closer the race came, the better it got. Arrogate, 2/1: I should start with Gun Runner because he is the morning line favorite. Make no mistake, though - handicapping this race starts and ends with Arrogate. His four-race run starting with the Travers last August was one of the great stretches of racing we have ever seen. He came from nowhere to win that Travers. Then he outdueled California Chrome to take the Classic. 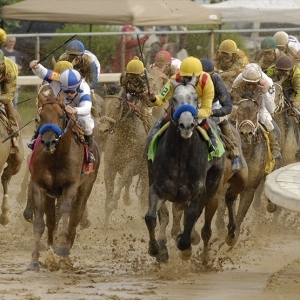 Next up was the inaugural Pegasus World Cup Invitational, where he faced a solid field and made winning look very easy. Finally he headed to Dubai for the World Cup and beat Gun Runner soundly. He won the three richest races on the planet consecutively and never seemed to be working too hard. He was given time off after Dubai, though, and it was like something was lost. Upon return he was a listless fourth here at Del Mar in the San Diego and then second in the Pacific Classic. Two duds on a track that has never suited him well. Far from ideal. The Classic is going to be his last career race, so we have to decide if he can recapture old glory or if his time is past. His lack of love for the Del Mar track is a concern. But he has been training recently in a way that we haven't seen since he was at his best. He is the most talented horse in the race -- or on the planet - so if he is in form he will win. That's a big "if", though. Simply, you have to decide whether you believe or not - logic can't really help you here. It feels very unlikely that we will see a price this high by post time because I think more people will ultimately believe than not. Gun Runner, 9/5: Arrogate is the most talented horse around, but Gun Runner has been the best this summer. Since his solid second in Dubai, he has absolutely crushed three straight fields here. Last time out he won the Woodward by more than 10 lengths. He's been working great, too, and he has excellent connections. There are concerns - most notably that he hasn't been at his best at a mile and a quarter, and I can't be entirely confident that he wants the distance at all. I lean towards skepticism, but then I admit to owning a full-sized pair of Baffert blinders. West Coast, 6/1: Stop me if you have heard this one - Baffert has a three-year-old that announced his presence on the world stage with a Travers win, and now he is the top sophomore in the Classic. It worked for Arrogate. The difference is that this horse came back and raced again after the Travers. He faced a pretty underwhelming field in the Pennsylvania Derby and just crushed it as very heavy favorite. And he has worked very well since - as Baffert horses typically do. I lean towards older horses over all but the most spectacular three-year-olds here - though I have correctly bet on three-year-olds three years in a row. I don't think he is quite as good as the top two here - yet - but he is absolutely a factor. Collected, 6/1: This is the Baffert horse I have the easiest time passing on - which is remarkable since he has won four in a row, his last win was a G1 here at Del Mar, and he beat Arrogate to win that race. He ran the race of his career there, though, and Arrogate decidedly didn't. This is a horse that can pick up the pieces rather than create his own opportunities, and I don't think there will be pieces for him to pick up. Mubtaahij, 12/1: The final Baffert horse is fascinating. This globe trotter has been all over the world running against the top horses around - he ran in the Kentucky Derby and the Belmont, and has been in the Dubai World Cup twice, for example. He just hasn't quite been good enough. After Dubai this year, though, he went through a massive change as he was moved to Baffert's barn for the first time. That means a very different training approach to what he has been used to. The early returns were positive - he won the Awesome Again and has trained faster than we have seen from him since. He'll need to improve a lot to be a big factor, but watching him is just fascinating. Churchill, 15/1: Aidan O'Brien joins Baffert, Todd Pletcher and a small handful of others in the discussion as the world's finest trainers. This horse doesn't make a lot of sense here, but if O'Brien thinks it is worth a shot then we have to at least pay a little attention. He has never run on dirt before, he's making his American debut, and he has run this distance only once - and it went badly. That was on very soft turf, though, so it may not have been conclusive. His four races since June have not been very good - though he looked his best in his last outing just a couple weeks ago. In seven starts from June of last year until May of this year, though, he didn't lose, won four G1 races and was one of the best horses on the planet. There is a lot working against him, but he's well-bred, very talented, and well-trained. On his best day he could make this interesting. ( Click here to purchase expert picks for the 2017 Breeders' Cup from Doc's Sports ). Doc's Sports has had a winning tradition for more than four decades. Don't believe us? Try us out for free, and we are convinced you will be a believer. Get $60 worth of free sports picks - members' picks just like our paying clients get - here .